Skoy: Our story is quite simple. We had a desire to share a cloth that is better than any cloth we have ever used and was environmentally friendly. We started to do a little research and were shocked to see how people were cleaning their kitchens. We were even more shocked to find out how many tons of paper towels were being used annually (2.5 million tons) and filling up our landfills. 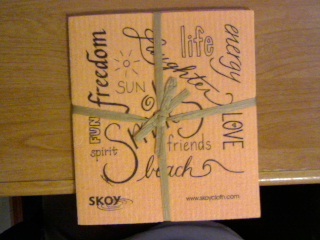 Michelle at Skoy sent me skoy cloth's to test and review AND give a pack for a giveaway! not only are these cloths super cute but they are absorbent, biodegradable and natural multi-use. It is a European made product. it is made from a natural cotton and wood-based cellulose pulp. It dries quickly, so it is not a breeding ground for bacteria. Have you ever used your sponge, then smelled your hand and it reeked of horrible bacteria? That will never happen again if you microwave your Skoy cloth reqularly. It is also dishwasher and washer/dryer safe. Amazing! 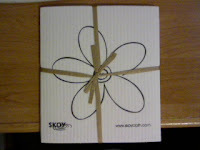 I have been using my skoy cloths for a little while now and I love them! I have used them to clean dishes, Pot's and pans, I used them to clean the stove top oven, The car, the bathtub, the windows..the list goes on and on..and they have not let me down! They absorb what ever I throw at them and they just keep on Truckin'. I'm an Okie (Oklahoman) you gotta over look my Southern phrases. SKOY School Fundraising: In response to inquires from local schools about raising environmental awareness through fundraising, Skoy has created a fundraising opportunity. Skoy provides fundraising order-forms and a few product samples for show (see pictures to the right). Once the fundraising period is over and all order-forms tallied, the fundraising committee will submit their order. 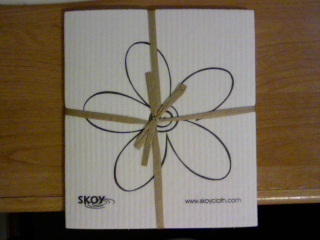 Skoy will ship out within 10 business days from payment receipt. We have created a customized print for school fundraising, which we combine with 5 regular colorful Skoy cloths into to an unique 6-pack, see picture to the right. How much does my school get? The children will sell each pack for $10, of which $4 will go to the fundraising. Consequently, the school will purchase each pack for $6. That is a 40% gross profit for your school! If shipping is required, the school is responsible for the shipping cost — if you want to use Skoy’s shipping service then the cost is $0.15 per pack. Just fill out the form below and we will contact you promptly! You can also give us a call (click here for our contact information). Giveaway ends : Thursday, April 7th 5:00 Pm Centeral time. ♥ I receive no monetary compensation for this review. 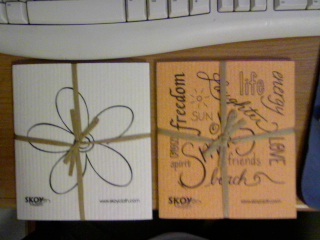 I was provided Skoy cloths to try and give my honest opinion.